If you see a tree wrapped in wire mesh in Stanley Park, you can bet beavers are nearby. Beavers are busy these days at Lost Lagoon, felling trees, in part, to dam up Ceperley Creek. Any sound of running water triggers these busy rodents’ damming instincts. Leaving the beavers to their natural activities would be ideal, but in a park visited by over 8 million people per year, solutions for co-existing with the beavers are necessary. 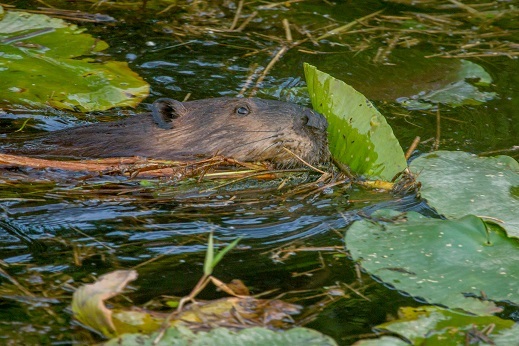 Click on this CBC news story to learn how SPES manages the beavers’ activities in Lost Lagoon and visit our baffler webpage to learn why there’s a ‘beaver baffler’ in Beaver Lake. Beaver management in Stanley Park is part of a robust, diverse program of Stanley Park wetland initiatives funded by HSBC Freshwater Initiatives of Stanley Park. HSBC Bank Canada’s commitment also supports: restoration of Park shorelines by planting native shrubs and trees, regular volunteer-driven water quality monitoring, environmental assessment of Beaver Lake, riparian restoration of Beaver Creek and other important wetland, creek and bog initiatives.